Every year I resurrect one of the great shape note tunes to use as part of our music for the season. Last year we sang “Milford” with a small ensemble and “Star in the East” congregationally. This year we are going to attempt an arrangement of Sherburne. Now singing shape note as special music is totally antithetical to the spirit of shape note singing but it’s a great way to introduce this rich heritage of congregational song to our church. My dad introduced me to shape note hymnals in college. 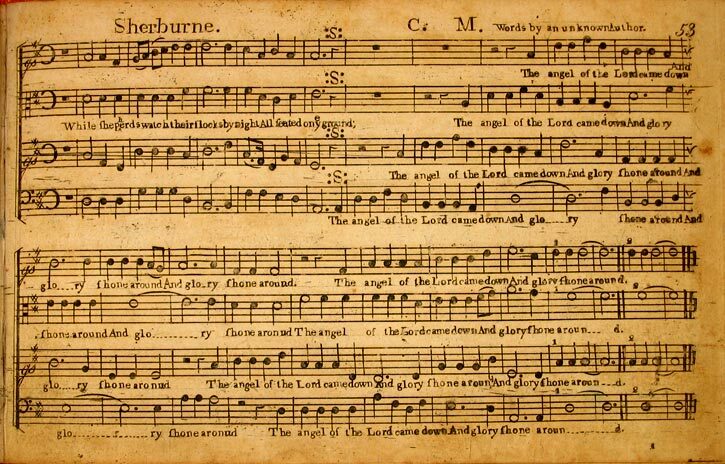 I find it interesting that there seems to be resurgence in this among urban people where shape note hymn singing has historically been a rural thing. In some ways shape note music was an alternative way to teach people to read music wasn’t considered to be the best way to teach music especially in urban churches that promoted musical literacy. However from a musical standpoint there is certainly a different style and beauty to the music which is directly related to the method of singing together in the hollow-square with a leader. Glad to see you using them. Buddy, thanks for the comment. I grew up singing shape note in the mennonite community in Virginia and it was sort of shocking (like…other people do this too??) to find that it was a tradition in other places off the appalachia (Southern Harmony, Sacred Harp,etc). I have really enjoyed the “Awake, My Soul” project that Matt and Erica Hinton spearheaded.